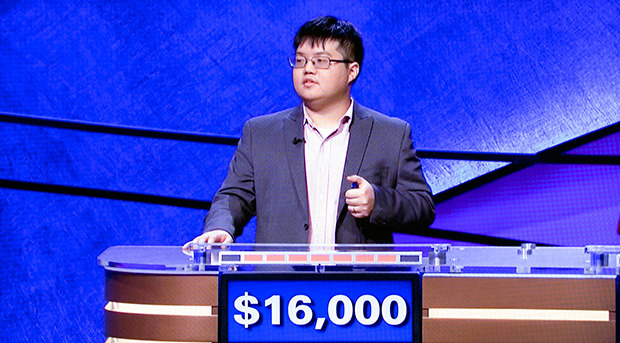 Arthur Chu is now a four-time Jeopardy! champion, and will return to the show in three weeks. (There's a Battle of the Decades tournament starting next week that interrupts his run.) A few hours before his fourth win aired, I spoke with Chu to learn more about his polarizing strategy, what he's forgotten in the three months since he taped his episodes, and where his wife Eliza keeps her meteorite. 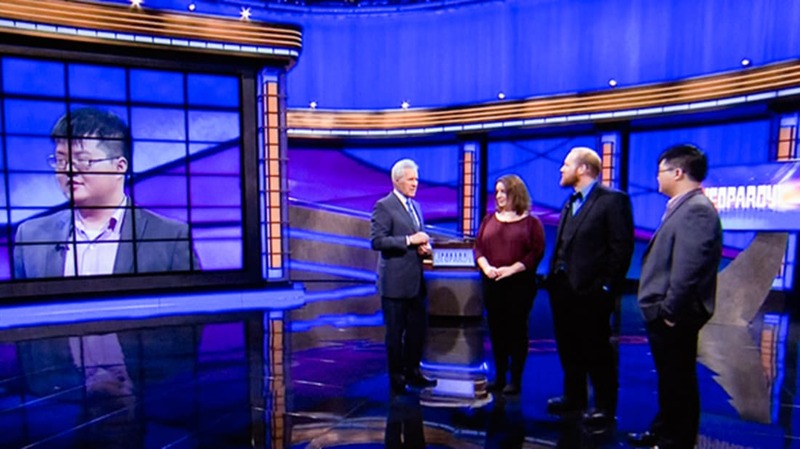 On Preparation & the "Full-Court Press" of Jeopardy! Higgins: What did you do to prepare for the show? Chu: I did a lot to prepare for the show. As soon as I got the call, I asked myself, "Do I feel ready?" And the answer was "No." So it became, "Okay, what do I have to do to feel ready?" I had very little advance knowledge other than just watching the show. So I jumped in and started Googling. And thank goodness we live in the Internet age, because there's a surprising amount of information online about Jeopardy! strategy. The game's been around for 30 years now in its current version, and there are a lot of people with a lot of opinions, so I started sifting through them. Someone on Twitter said it was like Jeopardy! Sabermetrics, which I think is a cute analogy. Malcolm Gladwell wrote an article about basketball a while ago, it got pretty famous, though it was attacked by a lot of basketball fans. I know nothing about basketball, so I don't know if it's accurate there, but I think it's accurate for Jeopardy!. He was saying that in basketball, whoever decides to initiate a full-court press gains this big advantage. A full-court press can negate a lot of the disadvantages you might have against a team that has more athletic players, or people who are just better—who have a higher shooting percentage. Just like that, you can negate a lot of your disadvantages in knowledge if you just use a strategy like the Forrest Bounce and the other players aren't ready for it. Most people don't do [the Forrest Bounce], for whatever reason. It's this thing that's waiting to be exploited. Whether it's out of a sense of sportsmanship, or a sense of tradition, or because it's more strenuous to do a full-court press, to be mentally bouncing around the board, it's harder for you too—it's just more hard for the other people. If you're willing to put in that effort, you greatly increase your chances of winning the game. So I do think that, whether or not the full-court press thing is true for basketball, the equivalent of doing a full-court press in Jeopardy! 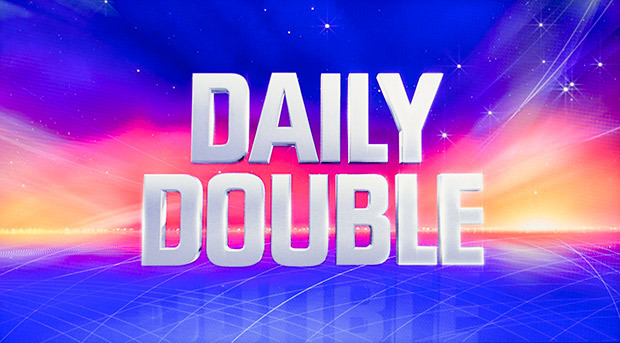 is doing the Forrest Bounce and hunting for Daily Doubles. It greatly increases your chance of winning the game if you can pull it off, and I saw no reason not to do it. On Flashcards & Becoming a "Jeopardy! 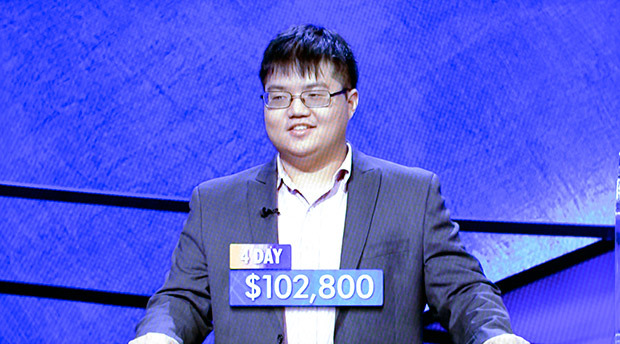 Machine"
Chu: As far as preparing for Jeopardy!, I did look up Roger Craig, who was a pretty famous Jeopardy! contestant (and a computer scientist), and who talked about how he developed an algorithm to scrape through the Jeopardy! Archive, which is entirely fan-made, and it's crazy that people put this much energy and intensity into it, archiving all the clues that have run, and then figuring out which categories are most likely to come up in the first round of Jeopardy, which ones come up in Double Jeopardy, which ones in Final Jeopardy. I figured out what knowledge is the most valuable for Jeopardy!, and then matched that up to my own deficits in knowledge, and just hyper-focused on boning up on those specific areas of knowledge. I don't know anything about computers and I'm probably way lazier than Roger Craig, so I didn't do it with his mathematical precision, but I did look up, okay, these things are always on Jeopardy! Of these things that are always on Jeopardy!, these are the easiest to remember. You know, it's not everything. There's a certain bias, there's a cultural bias to what they put in Jeopardy!. US Presidents are very important. State Nicknames, which are a thing that nobody has any practical reason to know, but they keep going back to that to generate clues. There are a few specific composers they want [you] to know. If they mention "a Norwegian composer"—this happened in a game, I think the Wednesday game—it will be Edvard Grieg. That's the method they use to write the clue. If they mention a "Polish Nobel Prize Winner," it's likely to be Marie Curie. If they mention a "Female Nobel Prize Winner," it's very likely to be Marie Curie. Jeopardy! is aimed at the sort of average TV viewer, so they're not going to ask things that are pointlessly obscure, they're not going to go in-depth on any particular subject, they're going to focus on these cultural touchstones that we all know. And if you watch the show, and you can identify those, you can literally make flashcards. So I used a program called Anki which uses a method called "spaced repetition." It keeps track of where you're doing well or poorly, and pushes you to study the flashcards you don't know as well, until you develop an even knowledge base about a particular subject, and I just made flashcards for those specific things. I memorized all the world capitals, it wasn't that hard once I had the flashcards and was using them every day. I memorized the US State Nicknames (they're on Wikipedia), memorized the basic important facts about the 44 US Presidents. I really focused on those. But there's a lot more stuff to know. I went on Jeopardy! knowing that there was stuff I didn't know. For instance, everyone laughs about sports—but I also knew that [sports clues] were the least likely to come up in Double Jeopardy and Final Jeopardy and be very important. So I decided I shouldn't sweat it too much, I should just recognize that I didn't know them and let that go, as long as I can get the high value clues. So that was how I prepared. I spent a lot of time watching Jeopardy!, we actually got TV, so I could watch Jeopardy!. We got an over-the-air antenna, which we didn't have before—we were watching everything on the Internet. But as everyone complains, there's no way to watch Jeopardy! legally on the Internet. I did watch a lot of YouTube Jeopardy! episodes as well, a lot of the old classic ones. I spent a lot of time on the Jeopardy! Archive, I spent a lot of time lurking on the Jeopardy! boards. I didn't sign up or register an account until after the show aired, because I didn't want any accusations of cheating or getting help from other people. I just kind of lived and breathed that, studying those flashcards, watching the game, and telling myself, "This person's doing something right, this person's doing something wrong, this is what I would've done in that person's shoes," and just getting in that head space. For a month, that was my life. So when I flew out, it was almost like a relief. I was like, "Whether or not I win or lose, this part of my life's gonna be over and I can go back to being a normal person again. But for now I'm going to be a Jeopardy! Machine." Other people like Ken Jennings said he didn't obsess over it that much—he probably is more naturally gifted at it. But I told myself, I don't feel like I have the natural gifts to do really well on Jeopardy!, but I feel like I can make myself win Jeopardy!, if I get really hyper-focused on the highest-leverage things that I can do to make myself a better player. Higgins: So that's after you knew you were going to be on the show. So how long did you try to get on the show? What was the process there? Chu: There's an online test every January. Once you've been told you've been put in the contestant pool, you stay in that pool for a year and a half. So I took the test, I got called back for an in-person audition, and was told I was going to be in the contestant pool, and that was for a year and a half. And I wasn't called. So the next year I auditioned again, and that time I was called. But all that happens is you take the online test; if you pass, you get an email asking you to come out for one day for an in-person audition where they just get a room full of people. They make you take a written test, and they make you play a mock game just to make sure that you're not insane, that they can put you on TV safely. And after that, it's like, "We'll keep you on file and call you." Most people, I think, never hear back. That's actually the thing—I was kicking myself, I could've been preparing for a full year! Nobody has more than maybe a 10% chance of being called just because they're in the contestant pool. So it would've been crazy [to prepare for a full year]. The only time I started actively preparing was in that one month after I got the call and knew I would be in the show. I was driving myself crazy over that, I was like, "If only I'd known, if only I'd prepared," but only a crazy person would prepare to be on a game show when they don't even know if they're going to be called. Higgins: Were you on the quiz team in high school or college, or anything like that? Chu: I was in Quiz Bowl in college, yeah. Swarthmore College. I was on the same team as the legendary Chris White. I don't know if he's actually legendary; Quiz Bowl's this kind of special environment. He was legendary among people who knew about Quiz Bowl. I have a lot of fun Quiz Bowl stories, most of them are kind of embarrassing. I was never a super-strong player in Quiz Bowl. Academically, the standards for Quiz Bowl are a lot higher than in Jeopardy!. But I did have a very aggressive style of play that sometimes got me in trouble in Quiz Bowl, but which I think has served me well in Jeopardy! so far. Higgins: So on Twitter you confirmed that you actually didn't read mental_floss, and guessed on that question. First off, good guess! Second, do you read mental_floss now? You can totally say no. Chu: I don't read the magazine, I follow the Twitter feed. I think, actually—maybe it wasn't entirely accurate to say I didn't read mental_floss. This is the modern world we live in, I think a lot of people don't actually read publications; they read whatever specific links show up in their social media feeds. And so I've seen mental_floss articles before, and now I follow mental_floss on Twitter and probably click on an article once or twice a week. I don't think I'm the kind of person who really subscribes to—you guys have a print edition, right? It's the kind of thing that, if I were starting a website I'd be interested in. It's very geeky, a very analytical take on random topics. That's the Jeopardy! way of thinking. Higgins: I think this has been talked to death, but I know that you looked at the wagering theory stuff before you played. Is it fair to say that you went into the game knowing, "If I get to Final Jeopardy!, and I'm in a good position, this is how I'll bet?" You already know that? Chu: Yeah, I had drilled that into myself. I actually committed a scripted play. I'm not a sports guy, but yeah, it's a scripted play. Because I told myself the absolute worst thing would be to pull a Cliff Clavin, [I didn't want to think,] "I know I'm gonna get this," and then lose when I didn't have to. If I'm gonna lose, then I'm going to lose because I'm forced into losing, not because of a stupid decision I made. So I'm going to outsource that [wagering] decision completely, I'm going to make that mechanical. And Alex will kind of play with you, I think you've noticed, he tries to get people to do exciting things. But I told myself, "Don't be tempted to switch your strategy around. Commit to maximizing your chance of winning the game—that's the most important thing, because that's real money you're playing for." Higgins: Just mechanically, I know you have the commercial break to do your arithmetic and make your wager. Roughly how much time is it, is that actually three minutes or something? You're sitting there looking at the scores and doing your math? Chu: An episode of Jeopardy! generally films in about the same time it takes to watch it. It's a very efficient show, the "commercial breaks" are about as long as the commercials actually go. Now in theory, they don't have a time limit—and the contestant people tell you you can take as long as you need to write down your wager. But obviously, they don't want to keep everyone sitting there for a long term, so eventually someone will come over and start hovering and saying "Ahem." They don't pressure you one way or the other, that's an ethical standards thing, but they can let you know that they'd prefer you be done. So I think that was a psychological advantage. Because I had this scripted play, I wasn't making the big decisions, I was just doing the math. I knew what the play was supposed to be. I just had to do the math and then I would write down the wager and be done with it. Other people were still making the decision. I think a lot of times, it made people think I was more confident in the category than I was. Because I was really not considering the category, I was just considering that this is the strategy I said I would use regardless of the category, but it psychs people out when they're agonizing over something and they see someone just write down a number and be done with it. Part of it was, I come off on the show as a little bit robotic. [Laughs] But I was on the show, and I had practiced everything, I had rehearsed everything, I was going to play the game to win—I wasn't feeling things out the way some other people were, and I think that psyched some people out, and I think it pisses some people who watch the show off, for which I apologize, but I'm playing for money up there, you know? Higgins: Going into your first game, what was your thought process? Take me through that moment. Chu: The moment when the game actually started? Higgins: Yeah, how scary is that? Chu: It was an adrenaline rush, I won't lie. I watched so much Jeopardy! before then, I could hear the theme song in my head. But to actually believe it was happening was so surreal to me. To keep myself from freaking out, and because I've acted in theater before, I said to myself, "I'm playing the role of a Jeopardy! contestant, and this is a TV show about Jeopardy!. We're going to pretend to play Jeopardy! now. But this isn't real. I'm playing the role of a Jeopardy! contestant and there's a guy playing Alex Trebek, and as an actor I have to portray the role of somebody who is confident and on their game, and fake that." I figured, oh, I can fake that because I'm an actor. So that was what kept me from losing it, but it also meant that, to an extent, I was adopting this persona that I'd built up in my head. Like, a Jeopardy! champion wouldn't freak out, a Jeopardy! champion wouldn't hesitate. A Jeopardy! champion would grit their teeth and lean in, be super-focused and engaged, and so that's the version of me that people are seeing on TV. But I had to suppress a lot of emotion in order to be able to play the game, as the game actually started. Also, the air in there is really dry. So every time I walked to that podium I got a static shock. I just told myself that was a good luck thing. Higgins: You taped the appearances in, I think, November. In the time between taping and airing, how much did you forget—that when you're watching TV, you remember, oh, that's a thing that happened? Chu: Pretty much everything. If you surprised me today and told me I had to play Jeopardy!, I would bomb out. I have to admit, it was a cram style of learning, and once I was done, I was like, "I don't even want to think about this crap anymore," so most of the knowledge has flown right out of my head. I [watch the show and think], "How did I know that? I must have studied that at some point, but I don't remember it." I did forget a lot about the little details. The things that people notice when they watch the show are things that I wasn't thinking about at all. Like my wardrobe—I stuffed whatever clothes I could into a suitcase that fit the minimum acceptable standards. [I thought,] "I can't think about what I'm gonna wear, they said bring a shirt and tie, so I'll bring a shirt and tie!" The [contestant] stories, that was the least important thing for me. I was like, "Okay, I have to have some stories. I'll just write down some things that sound like they'll make good TV," but I didn't really practice that. So now I watch myself, and I think, "Oh, I look so awkward." Worst of all, I'm presenting myself as an actor, and yet I did not plan for how to present myself charismatically and deliver these great, moving speeches about my life or whatever. And I'm just mumbling because I'm actually thinking about what just happened in the game. I was thinking, "Why does this have to happen in the middle of the game? You're interrupting my stream of consciousness!" Literally, I don't remember the other contestants' stories. I'll defend myself by saying they told us to do this! It makes me sound like a douche, but they told us to do this—that when the other contestants were talking, I was looking at the board and thinking about the game. So this feels like the first time I've really heard these stories. It's like, "Oh yeah, she teaches French, cool, I didn't remember that she did that. Oh yeah, he's a fraud investigator, I remember that about him." Higgins: On the days when these shows have been airing, what have you been doing? Are you just going to work as usual? Chu: Yeah, going to work, coming back home. Actually right now I'm in a play at Actors Summit Theater in Akron. And I am missing the livetweet, I missed the livetweet on Thursday night, and I have a [theater] show again tonight [Friday], that's why I'm tweeting on Pacific time at 10:30 instead of 7:30. It is, actually, really weird. It's like I live in a different world now than last week. Last week the biggest thing that I was doing was that I was in the [theater] show. 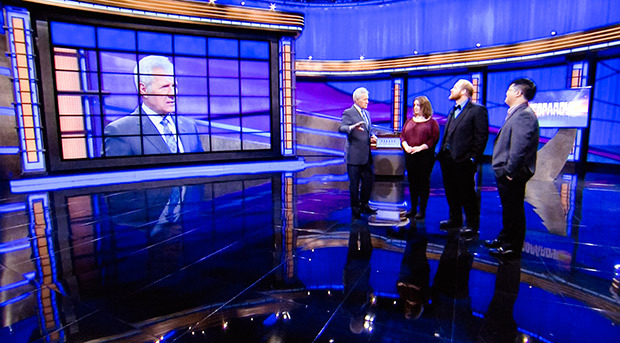 This week, when I come to the show, everyone wants to talk about Jeopardy!, but the show must go on. I'm trying not to let it take over my life, but my phone just keeps blowing up with tweets and retweets and it's hard not to read them. I haven't made any plans or anything, about, like, gosh, now I have a bunch of Twitter followers, what do I do with this audience? The whole thing was, "Hey, even if I lose, at least I'll have been on TV and said I'm a voiceover artist and gotten some kind of work from that, so here's hoping." Higgins: Have you gotten any voiceover leads yet from being on the show? Chu: I've had a few people call me, I've had a few people find my website and say they want my information. Nothing in terms of actual work yet, but some stuff that's promising. Some stuff that's local, most of this attention is still local, it's Cleveland people who're getting excited about it. A lot of people who read Erfworld are really excited about it, that's the web comic that I do voices for. It's a small job, but it's a geek niche audience and a lot of people read it. Higgins: Until yesterday, I wasn't aware of how intense the Jeopardy! blogging and tweeting and stuff was. The last time I was really engaged in the show was when Watson was on, and before that, Ken Jennings. To what extent do you follow this online Jeopardy!-verse? Chu: In the month that I was studying, I followed it pretty intensely. I watched Jeopardy!. I made Jeopardy! a can't-miss appointment, and I read the blogs, and I read the board religiously, because I was like, "This is where my head has to be." Afterwards, I didn't even want to think about it and I dropped it. I didn't even watch Jeopardy! except occasionally, because I wanted to get back to doing other things that I completely let go during that month. So I was pretty out of the loop when the shows started airing, but obviously I did want to know what people were saying. Eliza, my wife, was much more active on Twitter than I was, and she started seeing all these tweets come up, and she started retweeting them, because they were hilarious. I was just floored—I was like, "Oh my God, people have strong opinions about me!" I don't know if it was actually a conscious decision, but there was a tipping point when I realized I had two choices: I could either go into my shell and not acknowledge this, and wait for it to blow over it; or I could engage it, and milk it, and jump into the eye of the storm. And before I knew it, I was jumping into the eye of the storm. I don't regret it. At the very least it's been hilarious. Higgins: You've won something like $82,000 as of last night [this figure has since increased]. Do you expect the money to substantially change how you live your life? Chu: The way that I live my life, no. If I did, I'd probably be making a bad decision. You might have noticed that people say I'm aggressive. I'm aggressive, but also very conservative on Jeopardy! When I had the lead, that was the important thing. I'd think, "All I'm going to do is protect this lead. I'm not going to take any unnecessary risks." I'm that kind of person in real life too. So, yeah, $82,000 is a lot of money, but is it enough money that you can retire? Of course not. Is it enough money to guarantee you security for more than a year or so? No. So it's money that takes a lot of pressure off me, but I'm not going to make any big purchases. I think the biggest thing that money buys you is security and peace of mind, and my wife feels the same way. She always wanted to be a writer, this was her passion, but she couldn't make herself do it, because even with money in the bank, how can you quit a job and walk away from it—and not know if you're able to come back, if you try to write and it doesn't pan out? The more money we have in the bank, the more time she has to figure out what she wants to do with her life and how to manage her disability. So for me, that's very important. It's going to change my outlook on life because I'm not going to change the way I live my life. I can keep doing what I do now. I like my job, I like the way my life is set up, and now I know that if something happens, I don't have to worry, because I have money in the bank. To me, that's worth way more than buying a boat, or going on some spending spree that's going to make me happy for six months. I will say this now: It's very important to me to give some of that money back. I will not complain about paying taxes on it, and I will give a big chunk of it to causes I believe in. How often do you get a chance to actually make a difference with something like that? So I did mean it when I said the fibromyalgia thing [on Thursday]. Higgins: What's the craziest thing someone has tweeted at you? 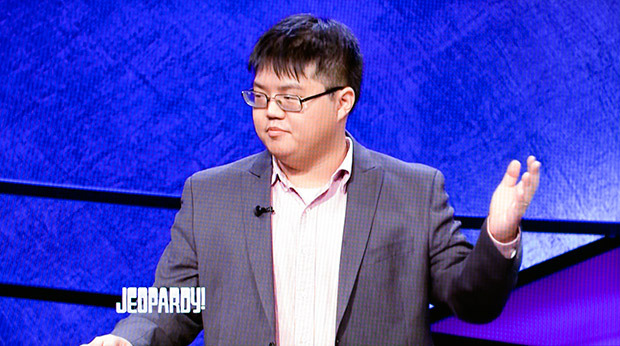 Chu: There was actually someone who said that Jeopardy! "used to be a gentleman's game and you've ruined it." 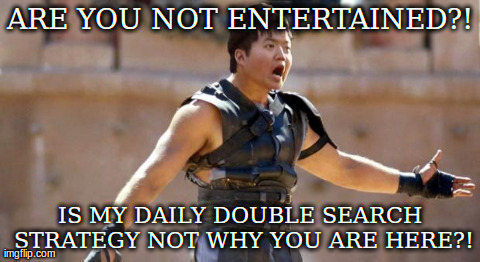 I think that's why my friend created that "Are You Not Entertained?!" meme. If you don't want [my playing style] to be legal, make it against the rules. Otherwise, for God's sake, I'm the one gladiating—I'm the one fighting for my life out there, and you think the way I do it isn't entertaining? "Are you not entertained? Is this not what you came here to see?" Higgins: What's the nicest thing someone has tweeted at you? Chu: I felt kind of bad because people saw my betting to tie as a humanitarian gesture, someone said, "Your bet on Jeopardy! restored my faith in humanity." [Read more about the strategy.] There was someone else who said, "This is everything that's wrong with the Millennial Generation, everyone gets a prize." Wow, okay. But yeah [laughs], people have been calling me King Arthur. "I would follow this man through the gates of Hell!" I favorited that one. Higgins: So where do you keep the meteorite? Chu: Oh, it's not that big, it's about the size of the palm of your hand, so it's actually on a little stand on Eliza's bookshelf. And her bookshelves are her most prized possessions. She has this enormous book collection, I think it outweighs our other possessions. It certainly felt like it the last time we moved. It's got pride of place, right under the lightsaber I got her when I proposed to her, but that's a whole other story. Higgins: We really appreciate your time. Got anything to promote? Chu: You know, the thing I mainly want to do is voiceover and performance. I'm not a Hollywood pro, but I would like people to check out my YouTube channel, check out the stuff I've done for Erfworld, check out my voiceover website, and I hope, if not to extend my 15 minutes of fame, at least to leverage it into steady work doing stuff that I've been dreaming of for a while.